An early booklet was published by J.Molina, Murcia, Spain. Black and white, smaller format, probably only on a very small scale for educational purposes. Imprenta J.Trigueros - Gran Via, 9 - Blanca - Deposito Legal MU- 302 - 1968. Reprinted in 1969. 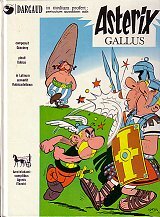 The book does not contain the map of Gaul. Publisher: Egmont Ehapa Verlag, Stuttgart, Germany. Originally the books were issued by Elsevier, Amsterdam/Brussels, albums [1-6]. Later publication was continued by Delta Verlag, which changed name to Egmont Ehapa.